Please review your request for missing or invalid information, then try again. You will not receive unsolicited communications. Thank you for requesting a quote from us. A member of the GID Industrial team will reach out to you shortly. Please also feel free to call us at +1 (972) 476-1899. We do our best to fulfill every request, but some parts are unavailable. Your patience and understanding is appreciated. Once you accept your quote and confirm your order, we prepare by retrieving related parts and components from our inventory. Anything we do not currently have in stock is sourced. Upon receipt, all parts are visually inspected for damage and then photographed to document their condition. Parts acquired from vendors must meet our quality standards. Industrial computer boards and other parts we are equipped to evaluate are tested to verify functionality and discover possible damage. Industrial computer boards have all components with low MTBF numbers (such as capacitors and connectors) replaced and are washed in our PCB cleaner to remove dust and grime. Industrial computer boards are fully diagnosed and repaired by our engineers. Logs of the problems encountered and solutions implemented are recorded. Industrial computer boards have all I/O connections rigorously tested to ensure that everything is working properly before the board is certified as ready to ship. After photos are taken to document the exterior condition of the part, it is packaged and sent to the customer. ESD-safe materials are used to protect sensitive equipment on its journey. Electronics Finder is a website of GID Industrial, an ISO 9001:2015-certified company that has specialized in servicing industrial computer boards and providing other industrial products for sectors including manufacturing, defense, aerospace, entertainment, healthcare, and more by utilizing our combined skills and vast international network of trusted suppliers since our founding in 2015. Do you need a 0.5US5-P0.1-W? We can help you find it at a competitive price! 1.00 x 0.81 x 0.43"
ULTRAVOLT® US SERIES MICRO-SIZED HIGH VOLTAGE POWER SUPPLIES Single-output micro-sized HV modules 3 Measuring only 5.75 cc (0.35 in ), the highly compact, micro-sized US series is specially designed to meet the needs of design engineers working with commercial, military, industrial, and medical applications. These modules allow access to voltages up to 500 V for customers with size-critical requirements. Features Typical Applications › Micro-sized: 5.75 cc › Small, lightweight, portable devices › Lightweight: 13 g › Fiber-optic telecom detectors › PCB ﬂat mounting: 11 mm height › Particle physics detectors › 4 models from 0 to 200 V › Laser range ﬁnder detectors to 500 V › Thin-ﬁlm bias › 100 mW output power › Avalanche photo diodes (APD) › Low ripple < 0.01% peak › Silicon photomultipliers (SiPM) to peak › Multi-pixel photon counter › Tight line/load regulation (MPPC) < ±0.01% › Ionization detectors › Low temperature coe‡cient < ±50 ppm per °C › Ultrasonic transducers › Small PZT drivers › Programmable HV output ±0.5% F.S. › ATE leakage testing › Output arc and short circuit › Bias supplies protection › 5, 9 or 12 VDC Input › Precision 2.5 V reference › TTL enable/disable/inhibit › Output voltage monitor › Metal case for low radiated noise › Optional ﬂying lead for HV output PARAMETER SPECIFICATIONS UNITS 5 VDC ±0.5 or 12 to 15 ±0.5 VDC Input Voltage Vin Inhibition mode: < 5 at full output voltage, full load: mA Input Current < 65 (200 Vout) < 60 (300 Vout) < 55 (400 Vout) < 50 (500 Vout) mA Fixed positive or negative Polarity 0 to 200 0 to 300 0 to 400 0 to 500 VDC Output Voltage 500 330 250 200 µA Output Current Via external potentiometer, minimum resistance 10 kΩ or via external voltage source 0/2.5V ±0.5% - HV Setting at full scale, and input impedance > 1 MΩ ±0.01% of full output voltage for no load to full load - Load Voltage Regulation ±0.01% of full output voltage over specified input voltage range - Line Voltage Regulation < 0.01% pk to pk at full output voltage and current - Residual Ripple < 50 PPM/°C Temperature Coefficient 0/2.5 V signal - Output HV Monitoring Accuracy: ±0.2% F.S. 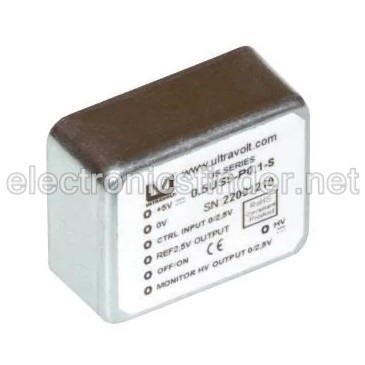 Output impedance: 1 kΩ 2.5 V ±0.5%, TC: 50 ppm/°C, max output current: 1 mA - Output Reference Voltage ON: 0 V, connected to ground - HV Power ON/OFF OFF: not connected Open collector compatible -10 to +65, full load, max Eout, case temp. °C Operating Temperature -40 to +70 °C Storage Temperature Output current internally limited - Safeguards Soft start feature: the start is guaranteed with no overshoot Note: Drawing views: third angle projections. PHYSICAL SPECIFICATIONS Steel, tin-plated, thickness 0.5 mm (0.02") Construction Insulation: fully potted in RTV 3 5.750 cc (0351 in ) Volume 13 g (0.459 oz) Weight > 2 mm (0.078"), spacing 2.54 mm (0.1") Pin Length Coaxial cable (RG178), diameter 2 mm (0.079"), length 500 mm (19.685") Optional Lead CONNECTIONS ORDERING INFORMATION 0 to 200 VDC Output 0.2US Pin Function Type 0 to 300 VDC Output 0.3US POSITIVE POWER INPUT 1 0 to 400 VDC Output 0.4US POWER GROUND 2 0 to 500 VDC Output 0.5US REMOTE ADJUST INPUT 3 5 VDC Nominal 5 Input +2.5 VDC REFERENCE OUTPUT 4 12 VDC Nominal 12 ENABLE/DISABLE 5 W Output 0.1 Power EOUT MONITOR 6 Steel, Tin-plated Case (Standard) Case HV OUTPUT 7 Positive Output -P Polarity Mounting tabs must be connected to ground. Negative Output -N Output Voltage Lead Wire -WS Option Popular accessories ordered with this product include the PCB-CONN-US. Example: 0.5US5-P0.1-WS Voltage Option Type Model Power Input Polarity IEC-60950-1 Non-RoHS compliant units are available. Please contact the factory for more information. The US series is not available in all territories. Please contact Advanced Energy ford details concerning sales in your area. For international contact information, visit advanced-energy.com. ENG-HV-USSeries-230-G 5.16 Specifications are subject to change without notice. ©2016 Advanced Energy Industries, Inc. All rights reserved. Advanced Energy®, AE®, and UltraVolt® are U.S. trademarks of Advanced Energy Industries, Inc.
Any product names, logos, brands, and other trademarks or media featured or referred to on Electronics Finder are the property of their respective owners. GID Industrial is not an authorized distributor, reseller, or representative for the products featured on this site, and is not affiliated with, sponsored by, or endorsed by any of the manufacturers or holders of the rights to the aforementioned products. All information on this site is displayed strictly for identification purposes and does not indicate a relationship with or an approval from any third parties. Page generated in 0.069 seconds.